This page will serve as a reference guide for some common shoe construction methods. If you need information on shoe anatomy and basic terminology, see our page on the parts of a shoe. The information on this page is somewhat advanced and will definitely resonate with shoe enthusiasts. 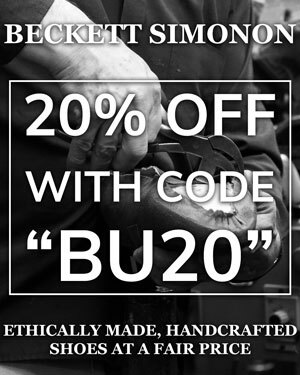 With that said, knowing about how shoes are made will enable you to make smart purchasing decisions, so we invite anyone to have a look. Goodyear Welt Vs Blake Stitch: What’s Better? Below: Goodyear welted Allen Edmonds boots in the rain. Nothing we wear puts up with the level of abuse that our shoes do. They collect sweat, get caught in the rain, have beer spilled on them at bars, and are scraped on the ground over and over again every time you wear them. They collect dirt, grime, and pebbles day in and day out. Most guys don’t bother to polish or condition them, which compounds the wear and tear. One of the biggest factors that determines retail cost and longevity is how the shoe is constructed. Upper: The part of a shoe that’s attached to the sole. Covers the top and sides of the feet; the uppermost part of a shoe. Insole: Part of the shoe that makes contact with the sole of your foot. The bottom of the inside of the shoe. Outsole: Commonly referred to as the “sole,” this makes contact with the ground and needs to be replaced every once in a while. Welt: Strip of leather that runs along the perimeter of the outsole & rests between the outsole and the insole. Last: The wooden form on which a shoe is shaped. Also refers to the basic shape or silhouette of a shoe. Goodyear welted shoes are widely considered to be the best constructed around. It’s the oldest and most labor-intensive construction method in existence. It’s constructed in such a way that any cobbler can resole this shoe repeatedly, and it’s incredibly durable. Usually made with double soles with outsoles that jut out from the upper, this construction method is widely utilized in British footwear in particular. Like all shoes, these were originally made by hand. Charles Goodyear, Jr. invented the machine to welt these shoes back in 1869. As you probably figured, this is where the name comes from. Prepare the insole for stitching. The cordwainer creates a “rib” that runs across the insole. Some makers cut and sculpt the insole, and others use a different material like linen tape. The purpose of the rib is to house thread in a later step. Attach the outsole and insole to the last. 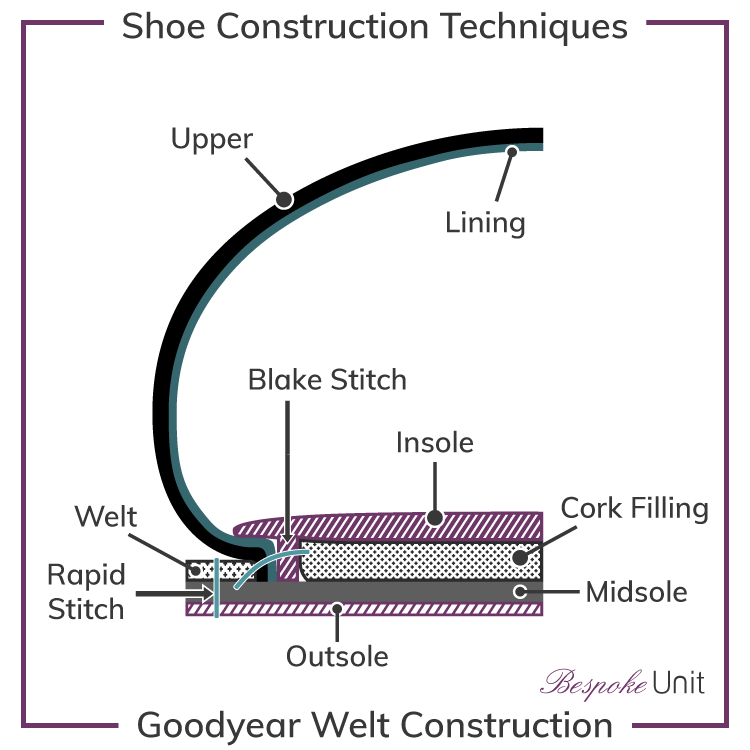 Welt: Shoe-specific thread is sewn through the welt, upper, and insole rib. The welt is then attached to the outsole through a second, separate stitch. A lockstitch is used for both of these stitches, which prevents unraveling if it wears out at any point in the shoe. Pros: The upper is attached to the welt via one stitch, whereas the outsole is attached to the welt via a second separate stitch. Incredibly easy to resole repeatedly as a result, this extends the life of the shoes for years and years. The extra layers help with water resistance and support. Cons: Some flexibility is lost with all these layers. Also, because the process is labor-intensive, Goodyear welted shoes are often more expensive than other types. The machine for Blake construction was invented in 1856 by Lyman Reed Blake. He later sold the patent to Gordon mcKay, hence the alternate name. Another child of the Industrial Revolution, it’s often referred to as a “Blake Stitch” and is less labor-intensive than Goodyear welting. This is very common on Italian shoes, which rely on the sleekness that this type of construction provides. The process is relatively simple: Upper is wrapped around the insole and these two parts are stitched to the sole. A single stitch attaches everything. No intermediate layers, no double stitches. Pros: Less expensive than a Goodyear welted shoe but can still be resoled. Also more flexible and lightweight than Goodyear due to that absence of the welt layer. Also great for shoes that require a close-cut sole that’s flush with the upper because there are no exterior stitches. Cons: Soles are less waterproof because the stitching allows water to seep in and the thinness of the sole wicks water into the shoe. A rubber sole would eliminate this issue, however. Blake-Rapid construction for shoes is a hybrid of Blake and Goodyear constructions. It adds the mid-layer welt found in Goodyear welt construction but keeps the Blake-stitching technique. This is typically seen on bulkier, more rugged shoes. This looks very similar to Blake construction. Used for shoes with flexible soles such as moccasins that have a simple design. Basically, the leather upper is wrapped around the bottom and sewn up. At this point, the sole is sewn directly to the upper. The value add? Your foot only comes into contact with soft leather. Pros: Comfortable, easy to make. 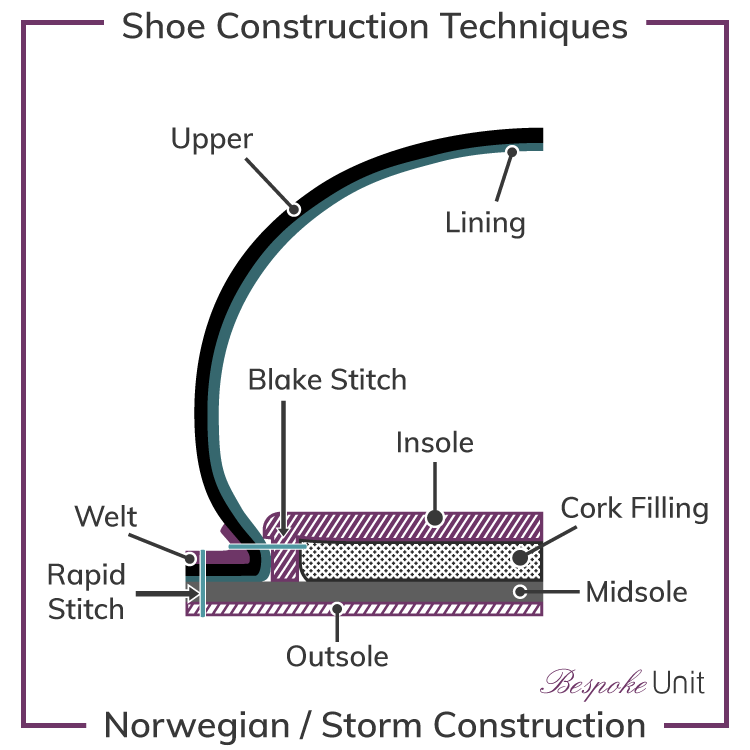 Also known as shoes with a “storm welt” or a “waterproof welt,” the Norwegian method is typically used on snow boots and ski boots that need to be as waterproof as possible. It is similar to a Goodyear welt in many ways. Unlike a Goodyear welt, the Norwegian welt is completely exterior. The stitching that holds together the upper, welt, and insole is visible on the outside of the shoe. This prevents water from entering the shoe at the seam between the upper and the welt. Cement construction is to the shoe world what fused canvas is to the suit world. The upper is simply attached to the sole via an adhesive, and no welt is used. A product of the Industrial Revolution, it’s cheap and fast. It’s also an incredibly common way to attach an upper to a sole. Pros: Inexpensive, fast construction translates to cost savings for the consumer. Excellent for sneakers, bucks, and other rubber-soled shoes. Cons: Can wear out very quickly and can’t be resoled. Once they’ve worn through, they must be replaced. Many higher-end moccasins utilize “genuine handsewn on the last” construction. It’s widely recognized as a way to craft an extremely comfortable pair of shoes. Genuine handsewn uppers are shaped and fitted to a last with simple tools and then sewn and tacked together by hand on that last. This creates an upper that is incredibly comfortable and flexible. Which of these methods is superior? If only answering this question could be so simple! An easy but not-entirely-accurate way to answer this would be “Goodyear is better.” In a lot of ways this makes sense. It’s a more robust construction technique that allows for more resoling and an even more extended lifespan than a Blake-stitched shoe would have. Sure, they’re more expensive, but the value add outweighs the additional cost. Still, it would be disingenuous to say that one construction method is superior to the other for all applications all of the time. Fashion-forward, lightweight Italian shoes would lose their character entirely if Goodyear welted. Slim, pointy monkstraps or tassel loafers needn’t have the double-thick soles that most Goodyear welted shoes do, and there’s value in wearing lightweight shoes as well. It’s safe to say that a guy can use 3-4 Goodyear welted shoes in his closet as his workhorses: black oxfords, brown brogues, that sort of thing. Your lightweight shoes that you need a bit more flexibility from, on the other hand, can utilize Blake construction guilt-free. Conclusion: What Shoe Constructions Are Best For Me? Each construction method has its own pluses and minuses, so the answer depends on your sartorial needs and your budget. If you wear dress shoes five days a week, you’ll want most of your shoes to be Goodyear welts. They will be put through the ringer whether you intend to or not, and you’ll see value very quickly after you’ve had them resoled a few times. If you tend to dress casually but still in an elevated way, Blake-stitched shoes will probably do the trick for you. The best thing to do is to buy shoes that fill your sartorial needs regardless of their construction, and then see what works best for you over time. No two men are identical in this regard, and you owe it to yourself to have some fun with different shoes. For more information on how to properly care for your shoes regardless of how they’ve been made, see our shoe care guide. You can also visit our main page on men’s shoes where we cover everything you’ve ever wanted to know about footwear.